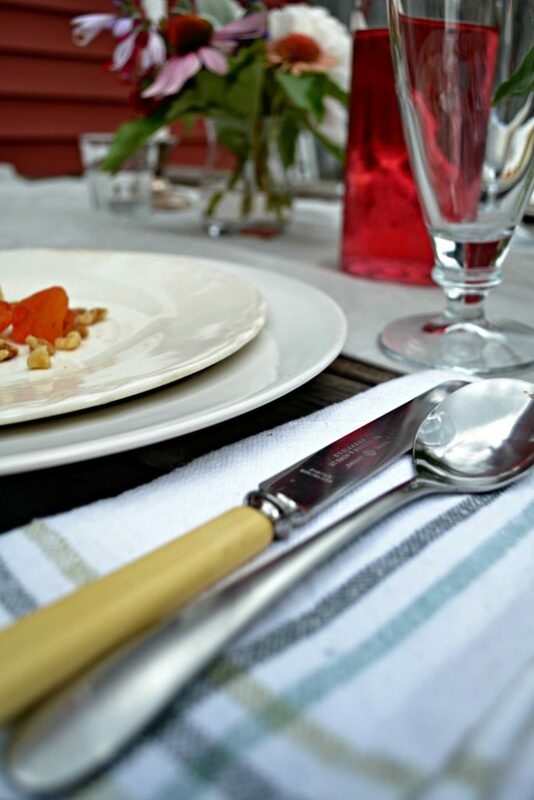 There is nothing quite as luxurious as dining alfresco on a warm summer evening. Today I am delighted to be part of a week-long blog hop hosted by Chloe from Celebrate and Decorate! 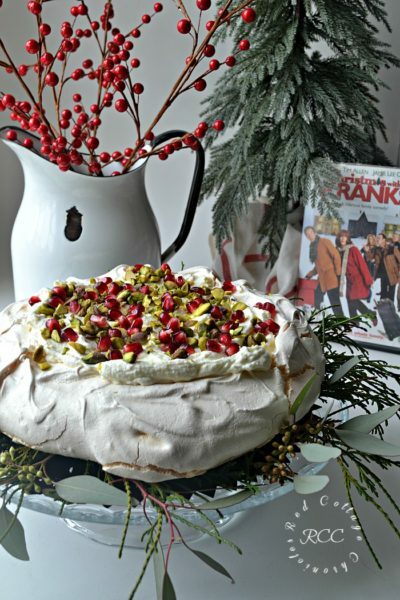 Alfresco tablescape ideas is the theme this week and you will not be disappointed by the impressive range of ideas from all the bloggers this week. All the links are down below, and be sure to check back each day as the they go live! 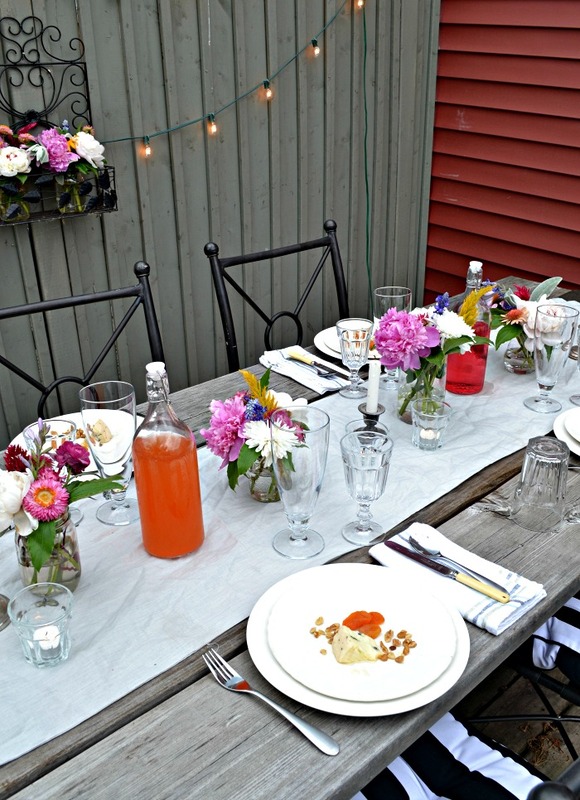 While it is well known that summer is my least favourite season, living in such a small home, summer gives us a chance to spread out and enjoy an evening of entertaining or a simple outdoor dinner for just us. I almost feel guilty about calling this a tablescape, simply because I think it encompasses all the things dining alfresco represents. Easy, relaxed and slow. I have always though the table decor should be effortless so as to enhance atmosphere that the natural landscape provides. It gives us all the chance to enjoy the chirping of the birds and watching them dart in and out of the birdhouses nearby. To listen to the fountain spilling into the pond in the background of animated conversation that can go on into the wee hours! I treat each alfresco meal a simple luxury that need not be forced or too fussy. 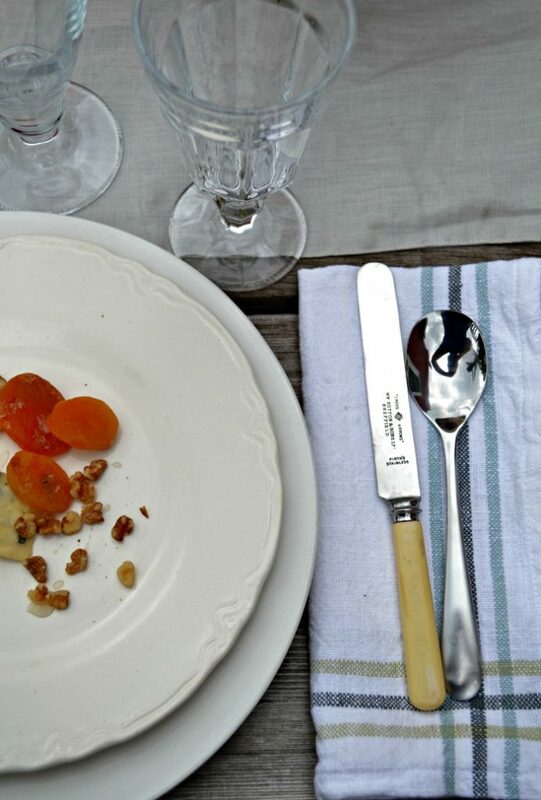 Simple white plate stack, cotton napkins and mixing antique flatware with brand new. Simple Ikea wine glasses paired with thrift store finds make sure everyone at the table has plenty to drink. Be it sparkling water, chilled juice or wine. 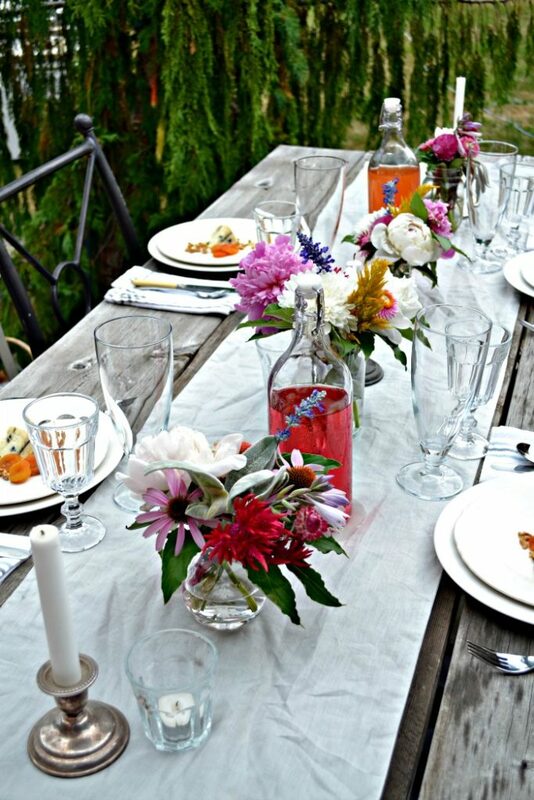 When dining out doors I rarely use a tablecloth, instead allowing the weathered wood of our harvest table to show. A simple linen runner is the backdrop to simple bouquets made by “arranging” market flowers into little glass jars and bottles. Chilled beverages are served chilled in Ikea bottles. 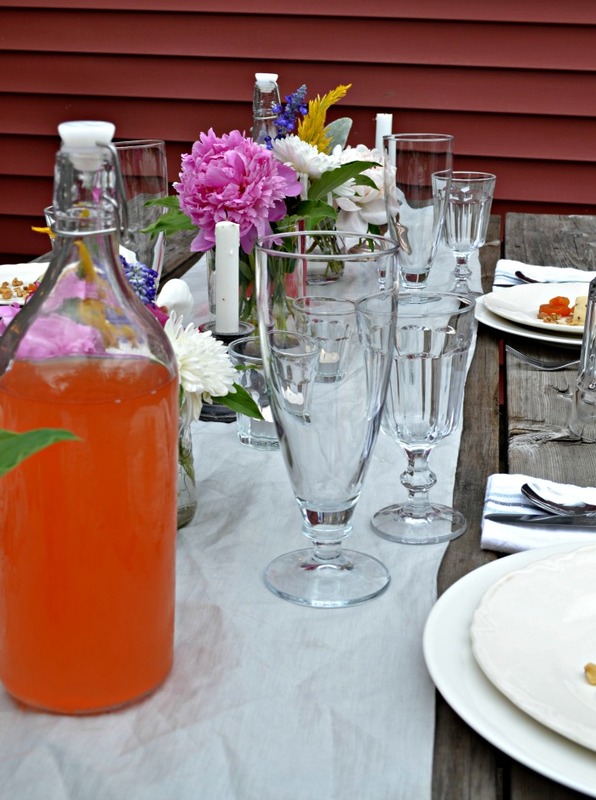 Juice glasses hold tealight candles and mismatched candle sticks hold simple white tapers. 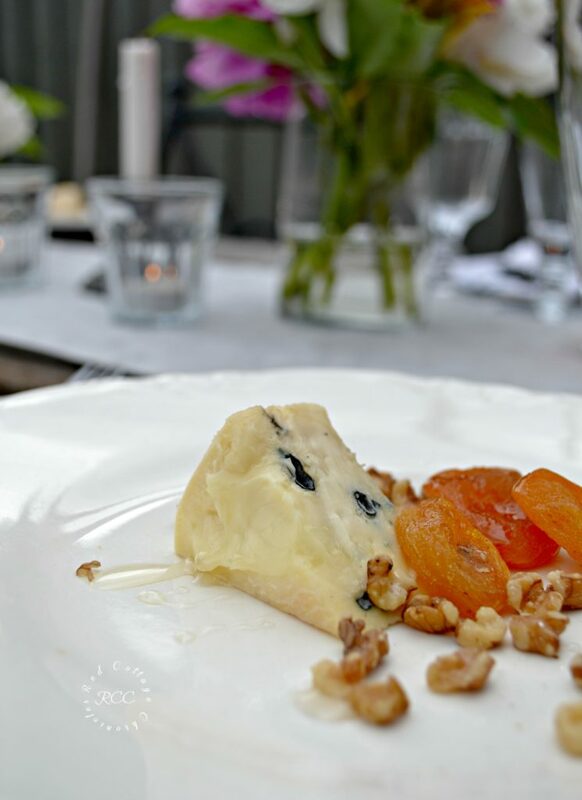 I decided to serve a plated appetizer of Stilton blue cheese drizzled in with honey, dried apricots and a sprinkled of toasted walnuts. It has been so incredibly hot and humid here this summer, but by evening a bit of a breeze had settled in. The sun had moved over to the front of the house, so it made for a comfortable evening. My husband commented recently how quiet the neighbourhood as been with neighbours choosing to stay indoors in the air conditioning rather than spend any more time than necessary outside. One more reason to dine outdoors late into the evening when the sun is going down and the temperatures cool off a bit! Sometimes it is just the Mr and I enjoying a dinner outdoors, and these dinners usually end up being the best. We spend time dreaming and planning, and scribbling landscape plans on scrap paper. Just a few more pictures! I am so pleased with how the flowers were super easy, yet make such a pretty statement! I spent only $20 at the market on two bunches of peonies and 1 mixed bunch and really got my moneys worth. Since rain was forecast for Sunday, I brought them all in and scattered them across our dining room table to enjoy! I really must post a photo of the table at the end of a meal! While it is messy and full, to me it still looks beautiful as it represents a time well had! 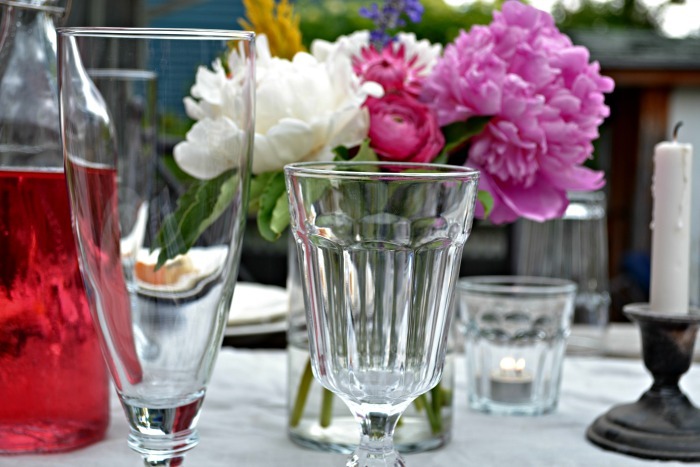 Whether you plan a gathering for two or twenty-two, always create table decor that speaks to you. If easy and relaxed is your thing like me, perfect. With all the talented bloggers participating in this weeks’ blog hop there is no shortage of alfresco tablescape inspiration. For more tablescape inspiration, be sure to subscribe for updates! Simply click here, enter your information and as a bonus I will send you your password to access or VIP printable library! Maureen, I agree that simple pleasures like alfresco dining is a luxury. 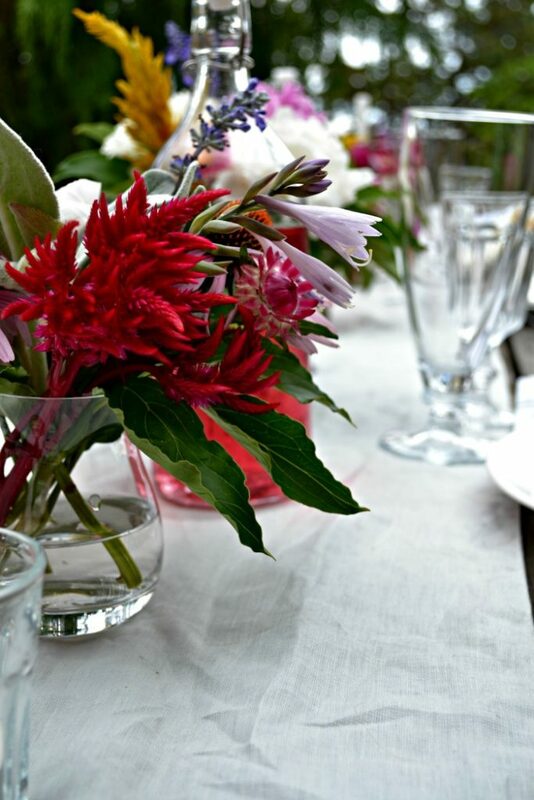 Your table is so inviting with your gorgeous market flowers. The appetizer looks so wonderful for a warm summer night and the bottles of chilled beverages are perfect pops of color. The simple runner and plate stack add an invitation to sit and enjoy the ambiance and hospitality! It is always a pleasure to blog hop with you! Thank you Pam. It is all about the company and conversation around our alfresco table! Maureen, Your market flowers are over the top beautiful! I love the combination of the blooms you chose. Very very pretty! Your cheese appetizer also sounds wonderful. 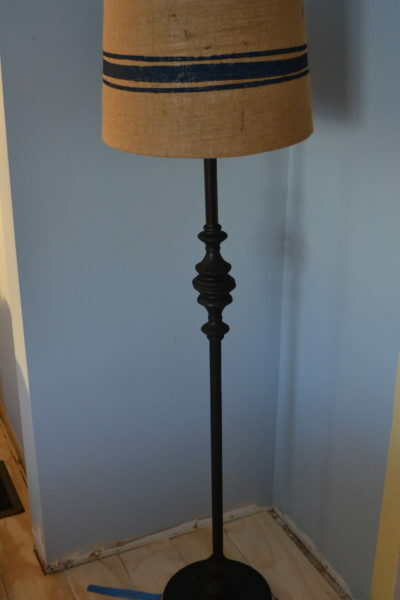 I love your weathered table and a simple white runner showcased your flowers so well. Lovely tablescape. I’m glad you and your husband enjoyed your alfresco meal. Thank you Bonnie! I am still enjoying the flowers inside! So beautiful and serene Maureen, I love the effortless casual feel that you captured perfectly! The simple jars of bright mixed flowers is a wonderful way to make things festive and welcoming, promising a good time to come…anything would taste great here! Lovely, and looks so effortless yet elegant! Thank you Carole! That is exactly what I was going for 🙂 Many an impromptu alfresco meal is eaten around this table, so effortless is a must! Maureen, your flower game is incredible! I wish I could grow such a nice variety as you have on display. Absolutely stunning, and the table settings around speak to their beauty. They’re compelling without being overpowering. Well done! Thank you! Give me some pretty blooms and I am a happy girl!! Maureen, I’m really glad you added so many photos of the flowers – they absolutely are stunning! My grocer never has such beautiful selections! Thankfully, though, I do have a nice abundance in my garden, and those are what I noticed in your mix – they look like flowers we’d easily grown and find in a landscape. It’s your description of the setting and the simplicity of the table setting that really makes this alfresco setting genuinely appealing to me. Summer should be about simplicity and you nailed it here, proving an alfresco tablescape doesn’t have to come with loads of bells and whistles! Thank you. Thanks so much Rita! My gardens are not producing well this summer given the heat and lack of rain. My limelight hydrangea is just about to bloom, as are my black eyed Susan’s but most of my plants are looking a little worse for wear! Maureen, your table looks so pretty! 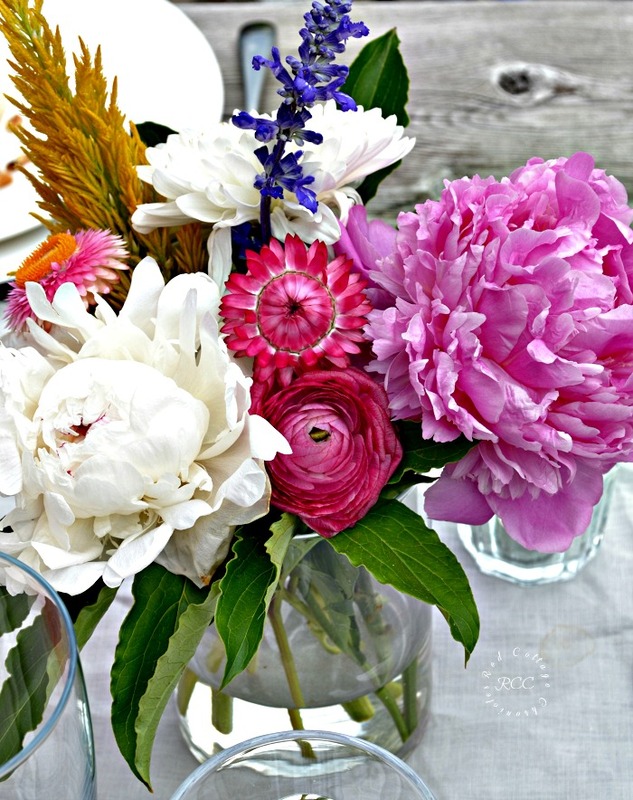 Your flowers are so beautiful – you did a fabulous job arranging them down your table. 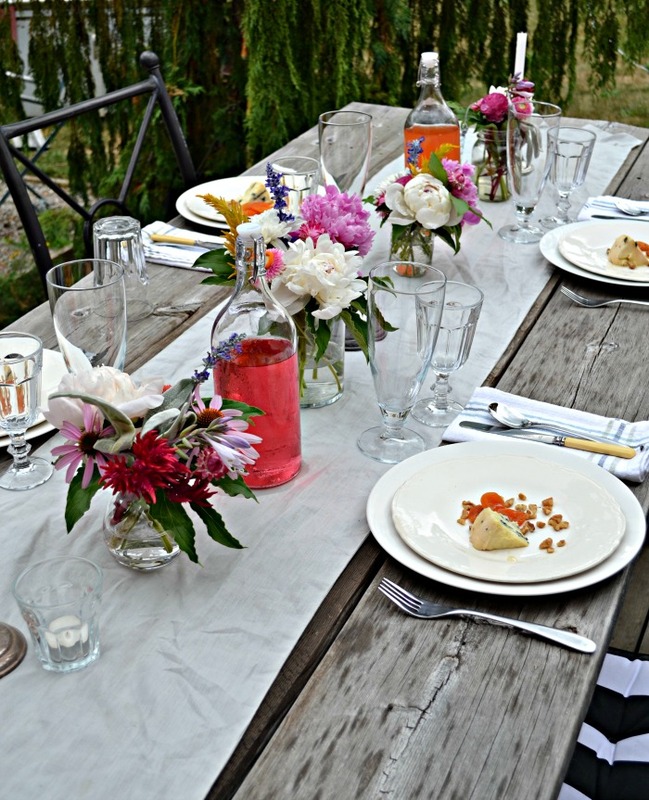 Using a simple white runner and white dishes just makes those flowers pop right off the photos. I should have headed your advice to make it effortless!!! This looks like a wonderful table to enjoy a quiet summer evening. Thanks a bunch Ann! The heat the summer as been a lot to take, so I am taking the simple is better approach to most things! You are right, this is a casual and easy table, showing all of your readers that you need not be extravagant to set a pretty and welcoming table. 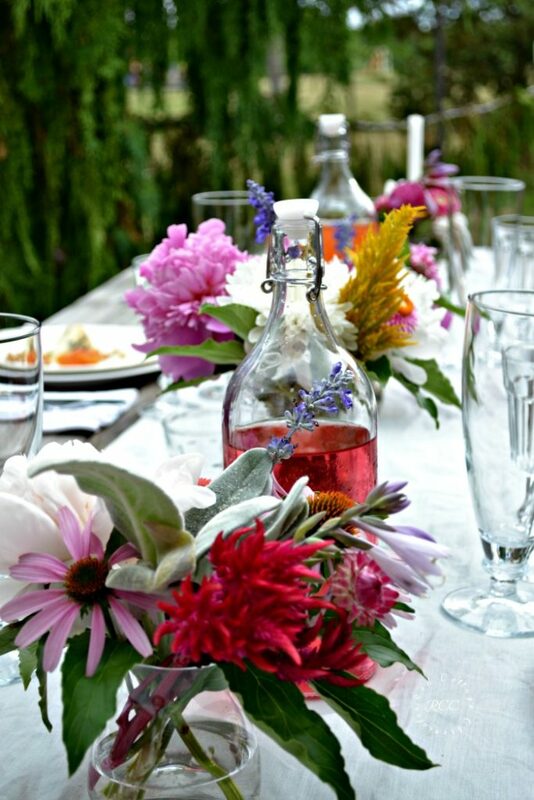 I think the bright flowers are enough to let your guests know that you have taken the time to make an effort to appreciate them. 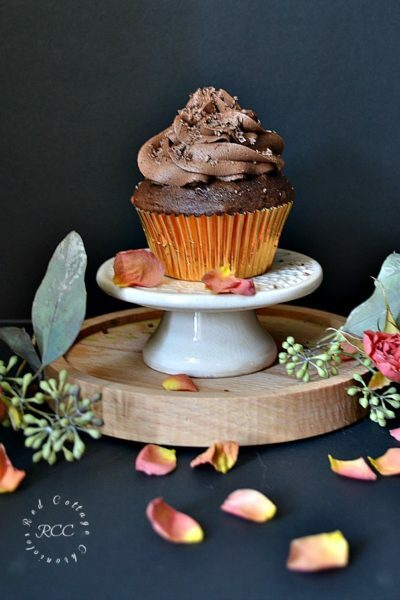 Thank you for once again joining us in another blog hop! Thank you Chloe! Always a pleasure to be included in such a talent bunch of ladies! Maureen, loving your pretty market flowers. They add so much to a table setting. The rustic table is a nice touch. I love to see the grain showing through. The cheese appetizer looks divine. Always a pleasure to dine alfresco, providing it isn’t too hot. Thank you Linda! Our summer has been over-the-top hot for Canada! Reaching over 100 humid degrees for days at a time. Cannot wait for fall! Love the easy, relaxed and slow attitude Maureen…and I am so jealous of your grocer flowers. Our choices are so …in need of a better selection! Did that make sense? LOL . I love your table runner and the combination of your white dishes. Thank you Kari! And, yes I know exactly what you mean. I was actually surprised to see such a nice selection of blooms last week! Summer simplicity and gentle elegance combined with such a glorious bouquet of flowers! You have most certainly captured the essence of Alfresco dining! Maureen I just loved both the beauty and simplicity of your table! No tablecloth, just the natural wood of the table —- brilliant idea. And, the flowers were all oh so lovely. Thank you Debbee! I have my finger crossed there will be similar flowers at the market this week! Simple things are often the best. 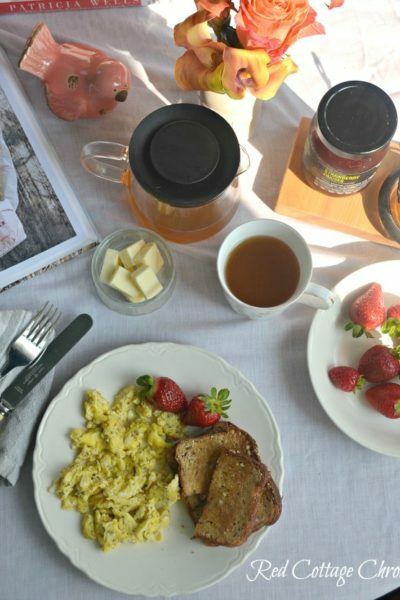 I love how you captured the ease and relaxed atmosphere of a casual meal outdoors. 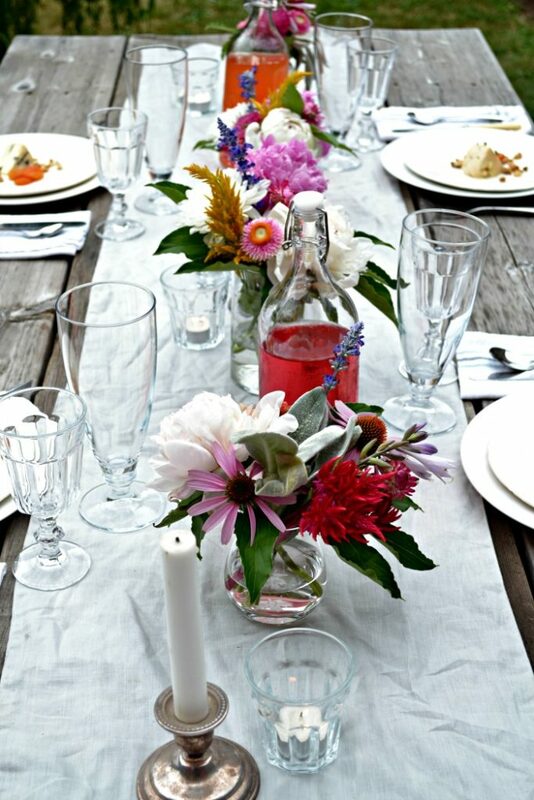 And I also love the wooden table, how it plays against the vibrant flower bouquet. All so perfect! 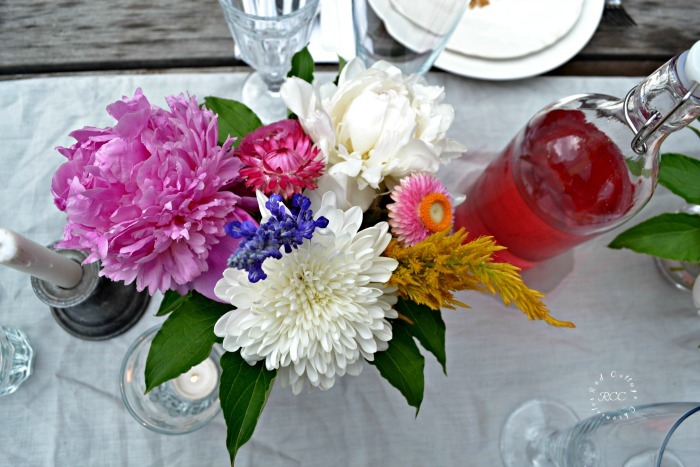 Maureen, the flowers on your table are so pretty ~ lush and colorful. The string lights are a romantic addition at night; they get such a magical feel to your outdoor setting. My favorite elements is your rustic wood table. It lends that natural, organic, casual vibe. Your weather must be cooler than mine! I would love to have dinner there such a pretty area for dinner! Maureen, I would love to dine at your beautiful alfresco table! It is just perfect for dining on some delicious eats while enjoying the pretty sights of nature. The gorgeous flowers make such a beautiful presentation. 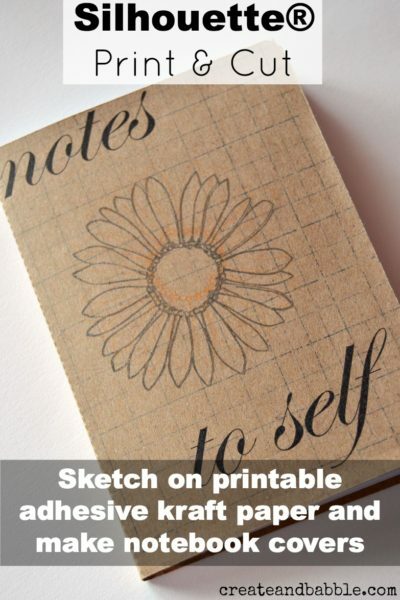 Great inspiration and ideas! 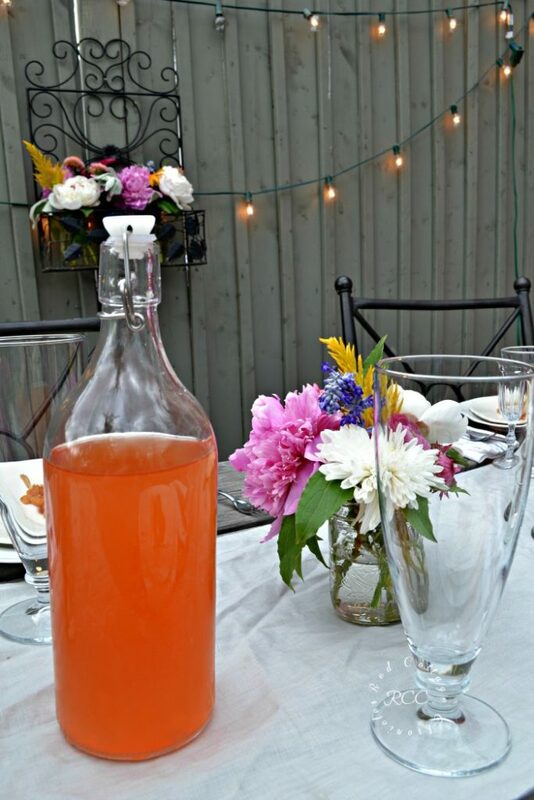 My 3 year-old grandson is sitting here with me, and when I scrolled down, he said, “I like doze flowers!” 😉 Love the clear glass items, especially the decanters holding the beverages! 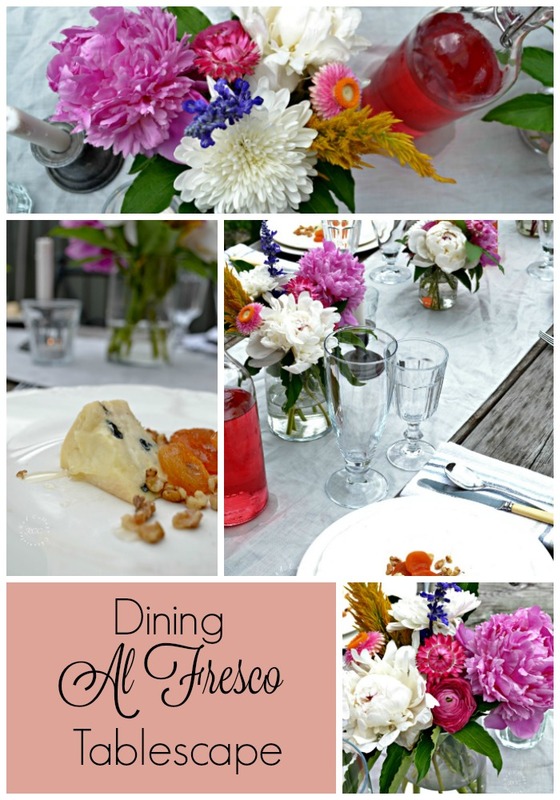 Pinned to my tablescape board! Awww! Thank you….That made my day Julie!! I would love to be a guest at this gorgeous table. Your detailed special touches are spectacular! The fresh flowers are my favorite. Thanks for sharing. 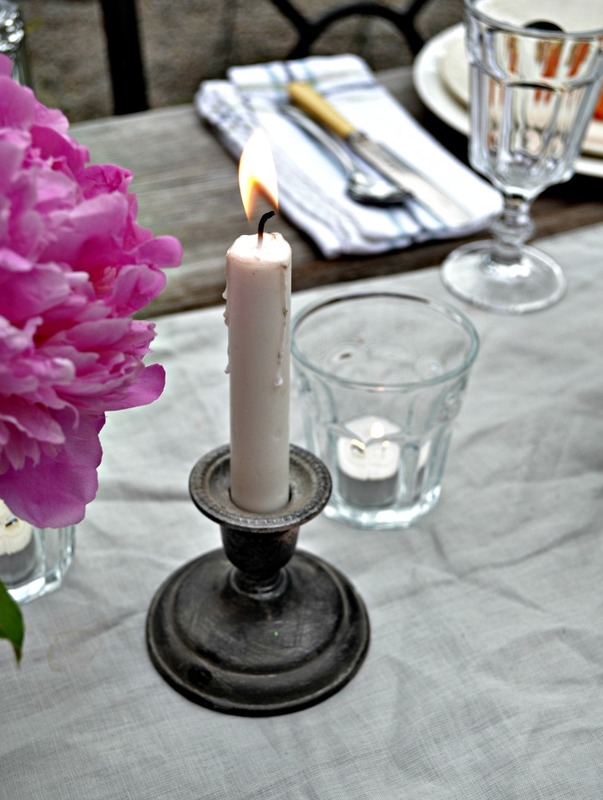 Such a beautiful and simple table setting! The flower arrangements are perfect!! Nicely done! 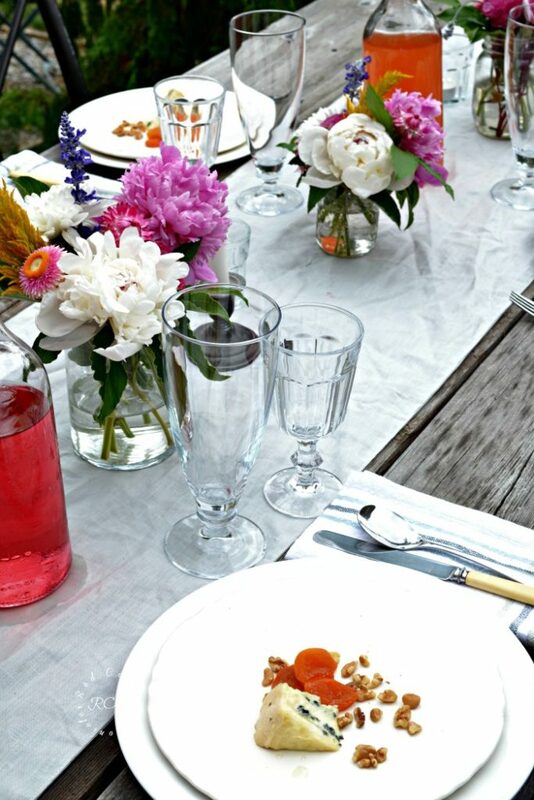 Oh my goodness who would not love to be a guest at this pretty table? Love the cut flowers and vintage touches. So pretty. Thank you Barbara! I really got lucky with all the choices at the market that day! Wow! Just stunning Maureen! I love how pretty the flowers look in the little jars! Everything is so inviting!